You know your loved one is in good hands with God guiding their journey. 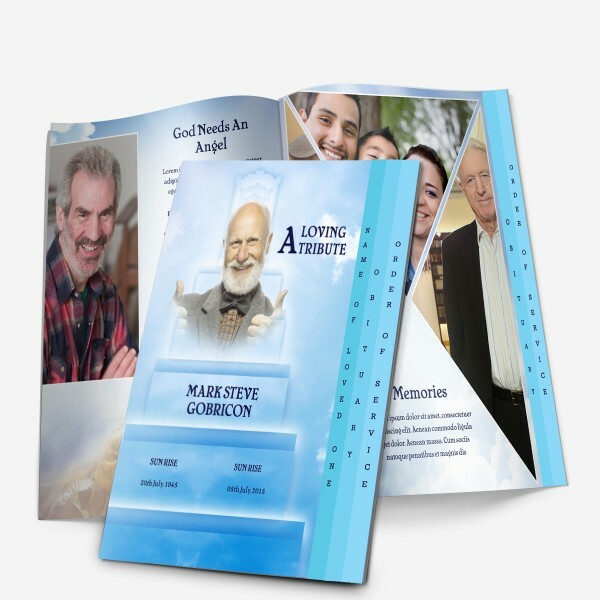 The proverbial stairway to Heaven carries them up to their final home, and that has been depicted here with the Stairway To Heaven 4-Page Graduated Funeral Pamphlet Template. 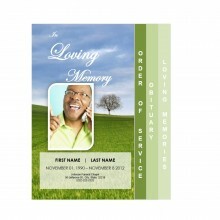 This memorial service program template, measuring 8.5 inches by 11 inches, comes ready to be edited in Microsoft Word. It will be ready for download immediately after purchase so that you can get started right away. We are happy to help you customize it if you don’t have the time or the energy for an additional fee. 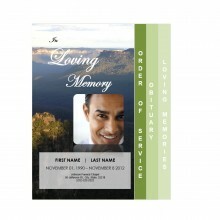 The Stairway To Heaven 4-Page Graduated Funeral Pamphlet Template allows you to honor the recently deceased by memorializing them in an elegant way. Featuring a baby blue background, a stairway featuring five steps leading up to a throne can be seen. 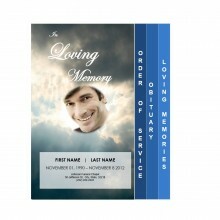 Insert a picture of your loved one who has passed away into the center and their names, birthday and date that they passed away on the bottom. Inside, four pages await, giving you room to add memories of the deceased, poetry, scripture and more. 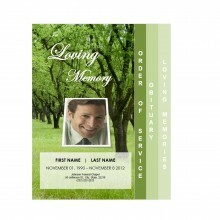 There are dedicated pages meant for the order of service, and an obituary template is featured as well.